Generally, staring at the desert is almost as much fun as watching the grass grow. The bland tan color stretches for countless miles, occasionally broken up by an off color cactus and other desert plant life. 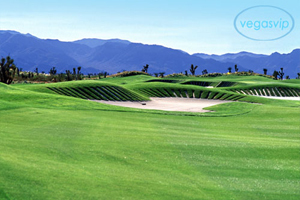 Since the desert can be so bland, when something like a golf course is placed in the midst of it, it can look a little shocking, and that's the best way one can describe how the Paiute Golf Club Resort looks. 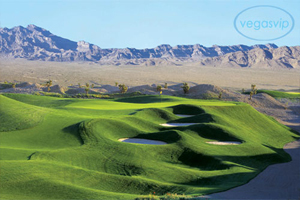 Paiute Golf Club Resort, as its name signifies, is far more than just your basic golf club. From a distance, Paiute looks like a foreign body of green placed amongst the tan, arid desert that surrounds it – giving the allure of a million dollar mansion built in the middle of a run down neighborhood. Paiute may be beautiful in its own sense, but the view of the tan wasteland and lack of scattered foliage could threaten cheapens the experience. If not for the resort's waterfront view, Paiute would suffer from its lack of scenery. Despite the surrounding area, Paiute offers an exquisite selection of three different golf courses, all varying in difficulty levels. The Sun Mountain course acts as the club's tamest course and offers an experience perfect for beginners and starting amateurs. Slopes and a winding landscape make up this course's main difficulties. Taking a mid-level difficulty is Snow Mountain, which challenges golfers with seven different water traps. Coming in as Paiute's most difficult course is Wolf, the newest addition to the resort club and the longest course in Nevada. Wolf's fifteenth hole offers an experience for those that enjoy a challenge. Separating the tees from the green is nothing more than an expansive body of water. No fairway, no sand traps – just water. Beginner golfers can make use of one of Paiute's two practice facilities, which come fully equipped with a driving range, practice green, and practice chipping area. Golf clinics are available to those that require that starting push before going it on their own. Memberships to Paiute come in two varieties – Platinum and PACC (Paiute Advantage Club Card). Paiute's platinum membership allows for unlimited play on any of the club's three courses, free access to either of the practice facilities, and discounted pricing for up to seven guests and Golf Shop merchandise. The far less expensive Club Card grants discounted rates for Primetime and Super Twilight golfing and resort Tournaments and brunches. PACC members are also given a free round of golf on every 7th round. Paiute's resort-style club house comes outfitted with a cigar lounge, the largest golf shop in Nevada, two outdoor terraces, and a full-size restaurant and bar. The restaurant offers a wide range of items ranging from fresh appetizers to well-portioned entrées. The house Chef, Chef Todd, keeps the experience new by alternating the menu's offerings dependant on the season. While Paiute may not hold a candle to the beauty of some of Las Vegas' other golf clubs, what it offers in terms of course variety and practice facilities makes it a location worth visiting. Though the term "resort" may be used loosely, Paiute has every right to label itself a premier golf club.